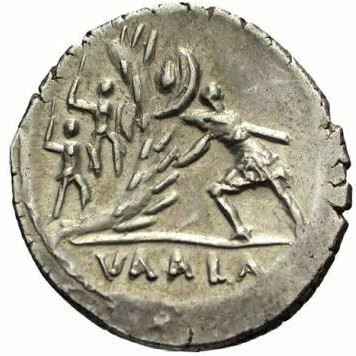 Caius Numonius Vaala was one of the moneyers for the year 41 BC. He is not otherwise known. Gens Numonia, occasionally written Nummonia, was a minor plebeian family at Rome. Members of this gens are first mentioned in the early years of the Empire. Few if any of the Numonii held any Roman magistracies. The only distinct family of the Numonia gens bore the surname Vala, also spelled Vaala, apparently obtained by an ancestor of the family who had stormed a vallum. As was often the case in imperial times, all of the individuals known from the family of the Valae bore the same praenomen, Gaius, as do most of the other Numonii mentioned in inscriptions. However, a set of inscriptions from the ancient Etruscan city of Caere, likely among the oldest, as the individuals named have no cognomina, demonstrate that the Numonii also used Aulus and Lucius. In other inscriptions we find examples of Gnaeus and Quintus.